PhotoDirector 8 is bursting with features and functions, and while certain tasks, such as importing images and image rendering, can be slow it’s certainly not a deal-breaker unless you have an old or slow computer. If you’re a beginner or enthusiast photographer looking for an alternative to Lightroom with similar features and some additional ones, it's well worth a look. With the image-processing and editing stages of photography going hand in hand with shooting, choosing the right software for your workflow is just as important as buying the best camera you can afford. In a software landscape dominated by Adobe products a number of smaller developers are working hard to produce compelling alternatives, and PhotoDirector 8 is a perfect example, pairing as it does powerful pro-level raw image cataloguing and processing with quick and easy effects for beginners. PhotoDirector 8 is aimed at enthusiast photographers, with tools that provide everything you need to make excellent raw conversions and process JPEGs, TIFFs and PNGs – and the results are so good that there’s no reason why the software can't be used by professionals too. For beginners there are a number of manual adjustments offering auto options, plus one-click presets that can be used to apply a range of effects at the touch of a button. The interface is intuitively laid out, with the main image processing controls on the left. Along the top there are six tabs covering Library, Adjustment, Edit, Layers, Slideshow and Print, all of which are fairly self-explanatory and sit below the main interface menu bar. If you’re familiar with Lightroom you’ll notice the two programs aren't a million miles apart. The main image window offers a selection of viewing modes, allowing you to choose what’s most convenient for photo browsing or image processing. The overall user experience is similar to that of Lightroom, but the main difference with PhotoDirector is that there are layers which can be used in a number of ways, including for making image adjustments, creating montages, and adding text. They’re not as versatile as layers in Photoshop, but they do help to create a bridge between raw processing and standard image editing, and you can complete many, and often all of your edits in PhotoDirector. PhotoDirector's cloning and healing tools are only suitable for basic editing, so if you need to do a great deal of cloning then Photoshop and Elements remain the best options; however, the Edit tab is home to tools such as skin smoothing and intelligent face and body shaping controls for people shots. 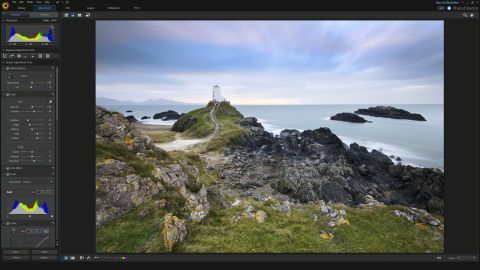 There are also tools for merging up to five exposures into an HDR image – these produce good results that will be ideal for most users, although they may not be refined enough for professional use. The biggest shout-outs from CyberLink focus on PhotoDirector 8's new Video-to-Photo feature. This allows you to import up to 4K (UHD) video into the software before converting the footage to a still image in a number of ways: you can capture a basic still from video, create a panorama by merging several stills taken from panned footage, while the multi-exposure option enables you to show the movement of a subject within a single frame, and you can also swap faces in portraits so that everyone in a group shot has the perfect expression. The software guides you through the process of each option effortlessly, and generally does an excellent job of producing the desired results. The downside to the process comes from the fact that you’re grabbing/creating stills from video footage, so images won’t always be as sharp as if they were shot as stills. For the best results you'll need to take stills from 4K footage, as the higher resolution will produce generally better image quality. You can of course take stills from 1080p or 720p footage, but for still images this is really quite low resolution, and image quality inevitably suffers. But this is all down to the limitations of video resolution, not the software itself, and Video-to-Photo makes light work of grabbing stills from video. Just be wary of using the True Theatre Adjustments, which automatically ‘optimize’ the image; the result brightens images, but also reduces detail and overall quality considerably. There are several other new features that are aimed squarely at enthusiast photographers. Motion Blur enables you to add exactly that to static images; it’s easy to apply and results are okay, but you can tell it's not an in-camera effect. Colour Splash on the other hand works exceptionally well to colour-pop images, which is where you retain colour in one part of an image while making the rest of the shot mono. Perhaps the most interesting new editing feature is 'express layer templates'. These built-in and downloadable templates apply a number of layers to images to create instant editable effects, and these can also be reverse-engineered so you can see how the templates have been put together using different layers, text, blending modes and other effects. PhotoDirector 8 is an attractive and powerful software option that comes at an affordable price for the Ultra version. This is a one-off license fee, so there’s no subscription involved – something that will be welcomed by photographers reluctant to sign up for services such as Adobe's Photoshop CC. While the cloning tools and layers don’t quite eliminate the need for another image editor such as Photoshop or Elements, they do make it possible to go from raw to finished image entirely within PhotoDirector for many shots. And with options to share directly to Facebook and Flickr you don't even need to open your web browser to share images.